BIG HAUL: TT boxers with their trophy and medals in Guyana after winning 18 medals at the 2018 Caribbean Championships. THE national boxing team, consisting of juniors, novices, youth and elite boxers, brought home ten gold, six silver and two bronze medals from the 2018 Caribbean Championships which concluded in Georgetown, Guyana. The medal haul was the largest ever by the twin island republic. 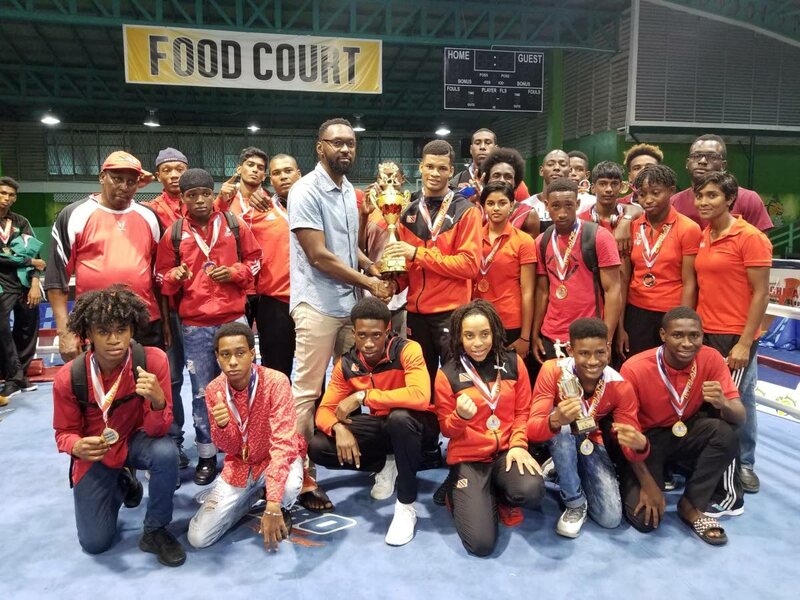 President of the Trinidad and Tobago Boxing Association, Cecil Forde applauded the team, noting that while it has not the largest team ever fielded, the medal tally was the best ever. “I’m very satisfied that we have delivered on our promise to excel at the event. We also copped the Best Junior Boxer award, and narrowly missed out on the first place prize, with Guyana edging us by one medal. Had the gold medals of the juniors been used in the final standings, we would have been the clear winners. Our boxers have performed quite well and we will continue to grow and improve from here on,” he said. The TTO contingent began the final night of competition with Tyrone St Clair giving an impressive performance against Guyanese Emmerson Farley in a novice super heavyweight bout. St Clair began the bout quite technically, scoring with good combinations and moving well around the ring. He continued in similar style to take the victory by unanimous decision. Despite an excellent start by Sharika Elias, who landed some beautiful right hands against southpaw Guyanese Abiola Jackman, the TTO boxer could not continue as she suffered a shoulder injury during the first round of the contest. With the referee issuing an eight count, the 16 year old Elias seemed to lose some steam as Jackman gained confidence and pressed the action. With another eight in the second round, the bout was stopped with Elias surrendering gold. Guyana’s Jamal Eastman and TTO’s Jessie Beckles began their contest evenly, with a good display of boxing by both men in the first round. However, early in the second round, a lead right from Eastman landed cleanly on its target, dropping Beckles for the count. Although Beckles raised his hands and indicated he was ready to continue, the referee called the bout to halt. Veteran Andrew Fermin fought a clever bout to edge Guyana’s Aubrey Headley for the gold medal. As in his semi-final contest, Fermin used the same strategy of shrewdly scoring his punches and then tying up his opponent. It was a tiring bout for both men, but the TTO boxer held on to edge his opponent for TT’s eighth gold medal of the event. The contest between TTO’s star Michael Alexander and Bajan Justin Edwards was a battle of southpaws that saw good technique and ringcraft by both men. Alexander maintained his usual flair and slippery movements, easily evading the punches of Edwards. The bout was low action, but Alexander kept ahead with simple jabs and the occasional right hook and straight left. At the end of the three rounds, the judges rightfully awarded the bout to Alexander. Wrapping up the event for TT was heavyweight Nigel Paul who made light work of Guyanese Shamear Mingo. The taller man, Paul used his height and reach quite effectively, scoring easy jabs and rights. Mingo tried his best to stay out of the way but a solid straight right followed by a left hook had the referee giving him his first eight count. Another clean combination by Paul warranted another eight count and the referee decided Mingo had had enough. Paul nabbed the 10th gold medal for the TTO contingent, much to the delight of the team. Head coach Floyd Trumpet said it was a good championship to gauge the present and future national teams. “The youth and juniors were superb, showing they are way ahead of their regional counterparts. The elite team has to step up in some areas, but generally I think TTO has a good team heading into the future,” he said. Gold – Tyrique Hosein, Tyron Thomas, Juan Rodriquez, Nyrell Hosein, Blessings Waldropt, Denzil Massy, Tyrone St Clair, Andrew Fermin, Michael Alexander and Nigel Paul. Silver – Ortega Jokhu, Jemell Joseph, Junior Cornwall, Nile Mohammed, Jesse Beckles and Sharika Elias. Best Junior Boxer – Nyrell Hosein. Reply to "Historic 18 medals by TT boxers"